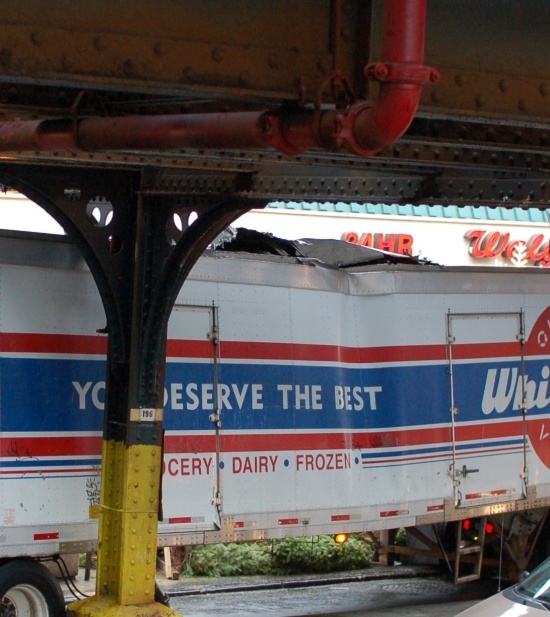 I caught two trucks scraping the bottom of the elevated steel structure carrying the (1) train’s tracks in the Bronx in two days! The first was last night. It looks like a moving truck (tractor trailer) scraped the el just south of 231 St, and then he was backed down Broadway to get out of the mess. He may have also bent a sign. The second was this morning, along the same section of Broadway. A tractor pulling a White Rose trailer somehow ended up in the northbound parking lane of Broadway, while facing south! Not to mention that he drove OVER the new raised concrete pedestrian refuge area adjacent to the Bx9 bus stop. And in the process, he tore up part of the roof of the trailer. This entry was posted on Wednesday, December 10th, 2008 at 10:36 am	and is filed under safety, subway. You can follow any responses to this entry through the RSS 2.0 feed. You can leave a response, or trackback from your own site.